The Manitoba Monsters – last season our guests averaged 6 Manitoba Master Angler Awards per person. 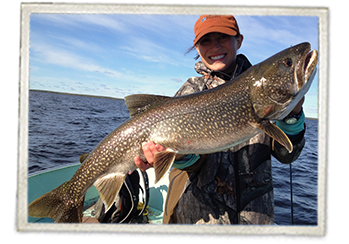 Fish for Trophy Northern Pike, Lake Trout and Arctic Grayling at our Northern 5 Star Fishing Lodge. The waters of Little Duck and Neganilini Lakes along with the Wolverine River system are virtually untouched and provide unlimited opportunities to catch all three species of trophy fish. Since we are the only lodge on the lake, our guests have over 300,000 acres of private waters to fish and explore without the possibility of seeing any other boats other than ours. 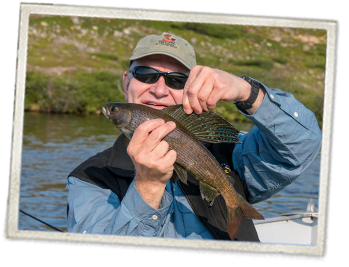 Hundreds of miles of shoreline with numerous shallow weedy bays, deep summer holes, mid lake reefs, streams and rapids provide ideal structure on any given day for trophy sized Northern Pike, Lake Trout and Arctic Grayling. A Manitoba record 22” Grayling was caught on a fly within sight of The Lodge and guests have battled monster Northern Pike up to 53”. Lake Trout in the 40” – 48”range are not uncommon. Because of our northerly location, the ice on our lakes is not typically out until the last week of June. This time of year provides incredible sight fishing opportunities for Northern Pike, and it’s very common to catch these monsters in 1 – 3 feet of crystal clear water. These fish are post spawn, and are basking in the warmer water that these bays provide. Lake Trout are also still very shallow (4-12 ft.) and Arctic Grayling are congregated in the moving water of the rivers and streams preparing for the spawning period in the weeks to come. After this initial ice out period of roughly 3 weeks, the different species will move to their summer locations and stay there until the mid-end of August. Lake Trout will be in deeper holes and drop-offs, the pike in and around various weedy bays and structures with deeper water access, and the grayling maintaining their presence in the rivers and streams gorging on the various hatches of flies that occur during the summer. The last part of August and the first couple weeks of September will see huge numbers of female lake trout swim into the shallower, rocky waters around extended points and reefs to start their annual spawn which makes the fall fishing for these monsters an absolutely amazing experience. Over the past 4 decades, The Lodge at Little Duck has been extremely consistent in their “catch and release” policy. Only a few smaller fish will be allowed to be harvested daily for either lunch or dinner purposes. The winner of this policy has always been our guests who reap the benefits with the high number of Trophy Fish that are caught on a daily basis. Whether your passion is fly fishing with large streamers for pike and lake trout or using tiny nymphs for grayling, or using spin cast gear with spoons or spinners, the waters surrounding The Lodge at Little Duck definitely has an angling adventure for everyone. There is little that can compare to the feeling you will experience in this beautiful untouched wilderness, while catching the fish of your dreams. Give us a call or send us an email, and we’ll take care of everything else.